Output jacks only have two connections and can become disconnected easily, so it’s important to know how to fix them. Output jacks can get disconnected easily. Despite its crucial importance to the signal chain, a jack has one of the flimsiest connections in a typical wiring harness. An output jack has only two connections: a hot wire coming from the pickups, and a wire connected to ground. Both wires need to be connected to the output jack for the signal to come out of the amp. 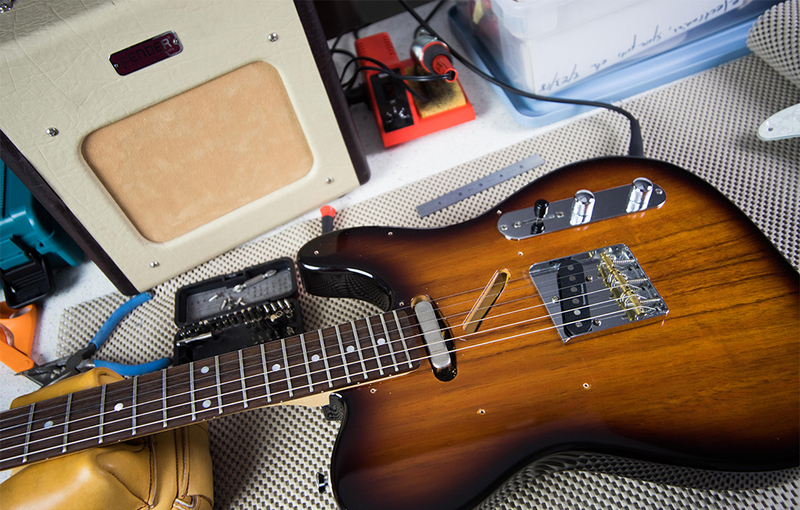 Switches, volume and tone pots, and pickups are fastened to the guitar with pickup rings, nuts, screws, and locking washers connected to each other with solder. However, those components aren’t manipulated as roughly or as frequently as output jacks. Every time a cable is yanked out of an electric guitar, it jostles the jack and the hex nuts keeping it in place. 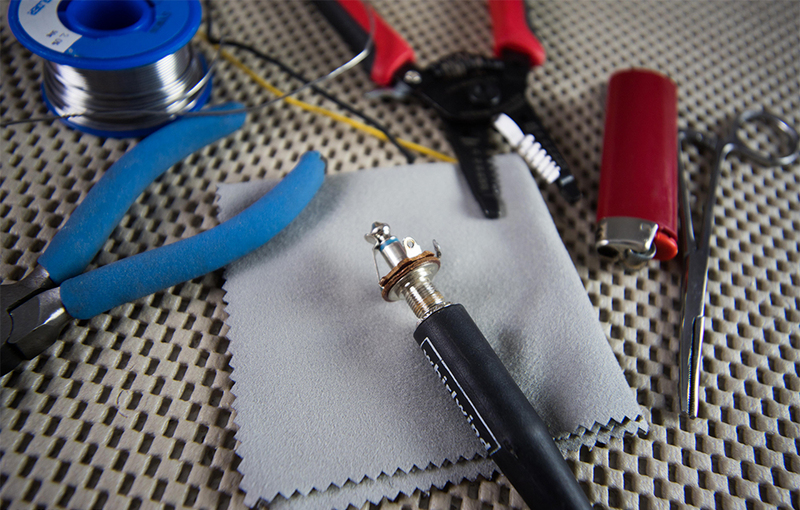 Because a jack’s connections are the most likely to fail, it’s important to know how to re-solder them into the circuit. 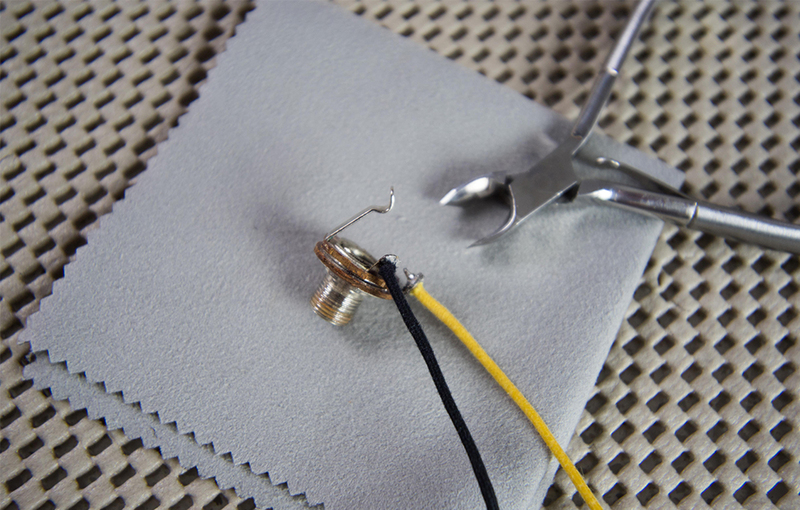 If a hot or ground wire is disconnected, simply cut the wire back half a centimeter, strip the shielding, tin the exposed wire, insert the exposed tip into the jack’s terminal, and apply a dot of solder over the terminal to seal the connection. Be sure to trim back any excess wire or solder that might touch the cable upon entry. It’s important not to “hook,” or bend the wire around the terminal when re-soldering. While it may make the soldering process easier, it’s murder trying to get it out the next time the connection fails.